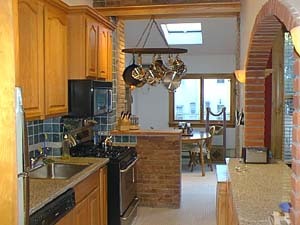 I decided to approach the kitchen renovation and replacement of the rear extension as one project. Both were in such bad shape that it made no sense to build new on to old. The original kitchen was pretty funky. 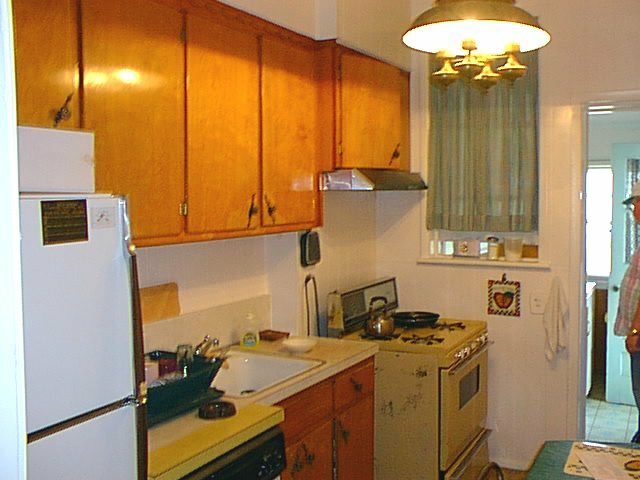 The cabinets were 1950s vintage and suffering from dry rot. There were no countertop electrical outlets. The ceiling fixture, as I soon discovered, wasn't even mounted in an electrical box. It was hanging on taped cloth wires. It was depressingly dark, requiring artificial lighting 24 hours a day. 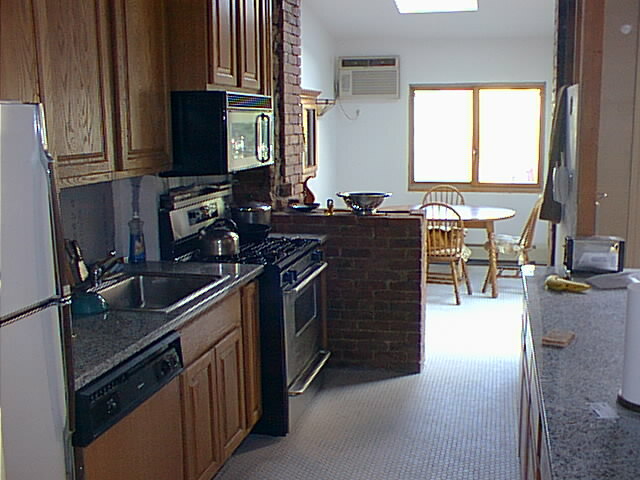 But the major problem was no countertop space. The original rear extension was a drafty laundry room, with a floor that suddenly dropped at a 15 degree angle. It was so riddled with termites that the owner had braced the shed with 2x4s, which were themselves chewed to pulp. It was neither insulated nor heated. There was evidence of old pipe breaks. 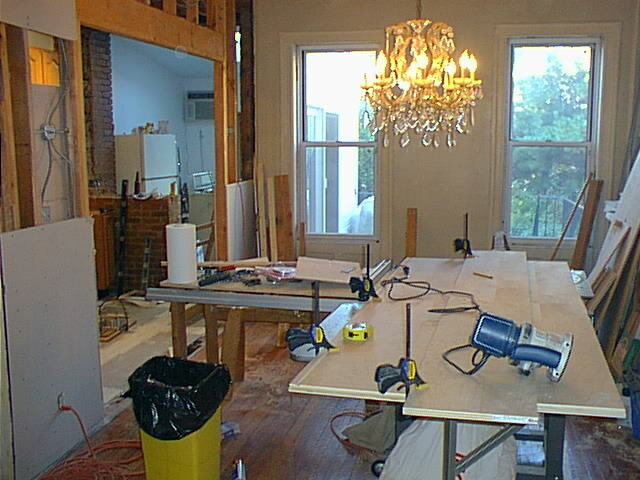 The large, ugly attachment at the upper right corner is a kitchen vent, the soffet made from sheetrock. There was a mini-rain forest growing in there. I'm still killing centipedes that once called it home. Pictorial anthologies have a deceptive way of compressing time, so I'll be honest here. This job started in early July and wasn't completed until the following January. Actually, it's still not completed. I've saved the final finish trim for one mondo project when the dining and living rooms are completed. 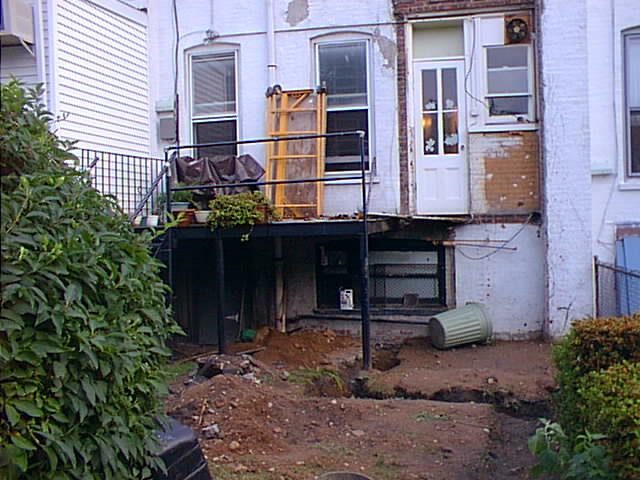 Thanks to the help of fifty generations of termites, the old extension was razed in about thirty minutes. 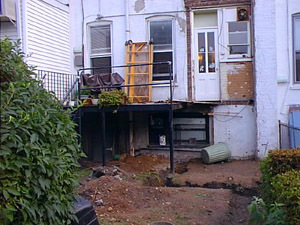 A trench was dug below the frost line to accommodate a concrete and cinder block foundation. Unfortunately, work began on the first day of the hottest ten consecutive days in NYC history. Due to the heat and despite constant spray from a hose, the foundation set up quickly. I decided to turn the bottom into a tool shed and unheated storage area. The rough framing went up in a day and was braced in anticipation of a thunderstorm due in town that evening. I know, bleh... vinyl siding. But it's inexpensive, low maintenance, easy to install and insulate, and it's only visible to my immediate backyard neighbors, who don't offer me much of a view either. 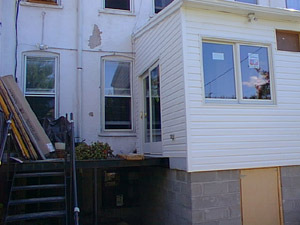 A six-foot Anderson slider, a four-foot Anderson window and a five-foot sealed skylight closed it in. Electrical was rerouted for the spotlights and to add another set of spots on the extension. These, like all the house lighting, are computerized with X10 protocol switches, under the command of a Linux server. There was a bit of time between these two shots. 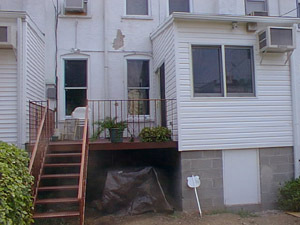 In the interim, new thermopane windows were installed along with a whole-house security system. You can see one of the sirens mounted under the soffet. The steel deck was extended three feet so it would be flush with the new extension. The location of the air conditioner was a bit of a disappointment. I would have liked it over the window but there wasn't enough height available because of the upstairs window unless I went with a flat roof. Interior finishing begins. A dedicated 20a circuit feeds the outlets in this room as well as the outside GFCI. A 220VAC outlet was installed for the 18,000 BTU wall air conditioner. The walls and ceiling were insulated and the sheetrock hung. 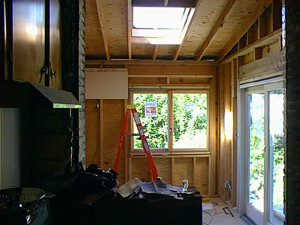 Purists will be skeptical of all the small pieces of drywall I used over the window but I under-ordered for this stage. I only owned motorcycles and I didn't feel like paying a lumberyard $50 to deliver an eight-buck sheet of Type X. I'm pretty good with a taping knife though. 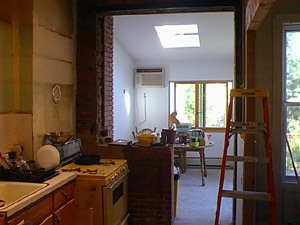 As a solution to a dark kitchen lacking in countertop space, I decided to blow out the wall between it and the dining room. I wasn’t sure at this stage exactly what I wanted to put in that hole, just that I wanted a hole there. 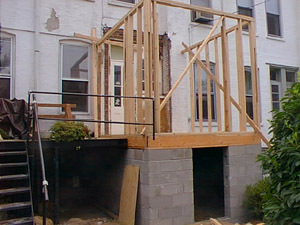 One of the myriad problems with renovating old houses is lumber dimension. These are real 2x4s while modern 2x4s are actually 1-1/2” by 3-1/2”. That extra half inch means trouble with drywall later so I opted to toss them all out and reframe the wall with new lumber. This wall also had old sheet metal air ducts hidden in them, which is curious because the house has ancient steam heat. The pass-through is framed and another dedicated 20a circuit is run for the outlets on that wall. The old gypsum ceiling was pulled down and furring strips tacked up to accommodate a tin ceiling. 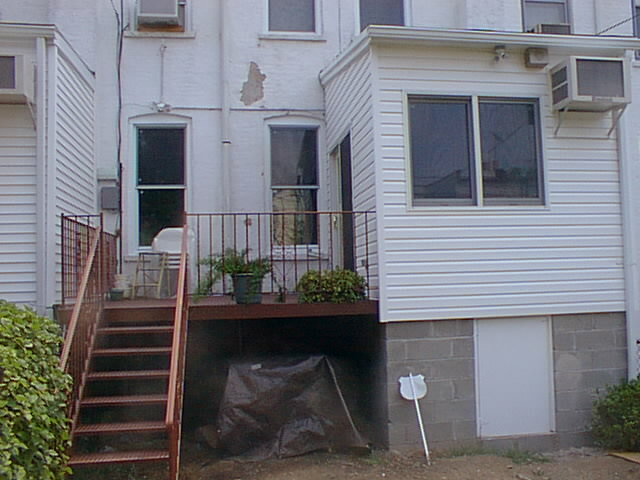 The front wall was in such bad shape that I tore it down and reskinned it with sheetrock. Another 20a line was pulled for the fridge. The old refrigerator was originally sharing a circuit with most of the first floor. Without a doubt, the most miserable job was cleaning the brick in the foreground. Because the new extension is wider than the old one, this was originally outside brick so it had a hundred years of paint, cement parging and ThoroughSeal on it. I used a heat gun, K-Strip, Peel Away, a grinder and four gallons of muratic acid to get it to this stage. If I had it to do over again, I probably wouldn’t. I still have to tuck point it. The same picture from another perspective. The interior on the extension was skimcoated using a nifty tool called Magic Trowel. Thinking ahead to winter, I added a steam baseboard unit under the window. I'm real glad I did that. You'll notice my cat, Chopper, on the window sill. He manages to find his way into a lot of these shots. The plumbing fun begins. 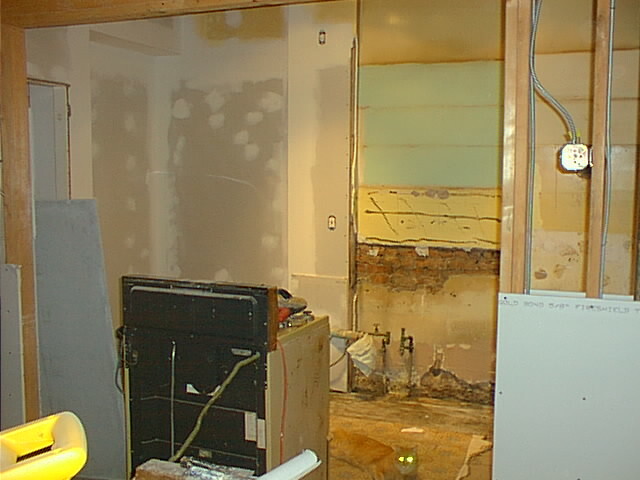 After ripping down the old cabinets, it was like urban archeology: the Yellow Period, the Sea Green Period, the Creosote Period, etc. The pipes and drain were shot. I ran new copper down to the basement and new no-hub drain and vent. There's Chopper again. 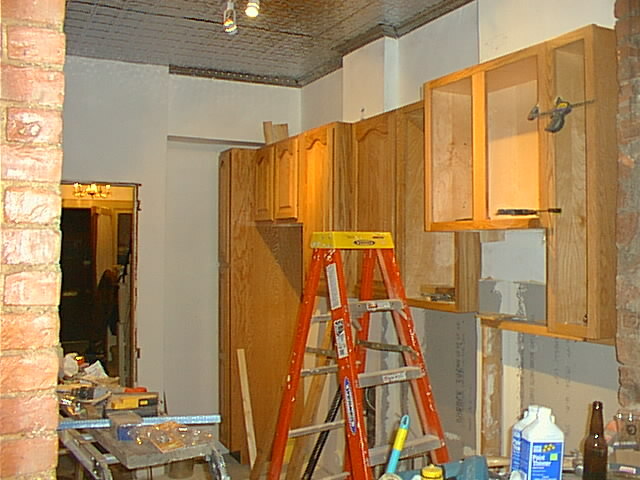 The tin ceiling is almost up, except for some missing crown moulding (yet another under-order). 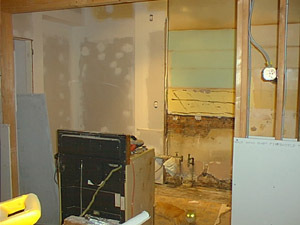 The cement board is on the floor and walls. The new cabinets are being hung. 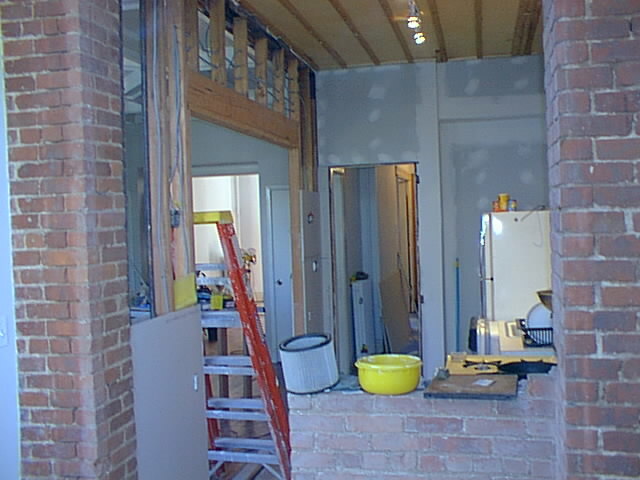 I was deep into that stage of home renovation where friends knew better than to return my calls so I did this job by myself, using temporary scaffolds. My cabinet workshop. I bet Norm doesn't have a chandelier in his! I finally decided what I wanted in that pass-through: a granite counter with a brick eyebrow arch, inspired by a Mexican restaurant in Dallas. The cabinets are up, the granite is down, cement board is on the floor and walls, and the new appliances are installed. I decided to go with an inexpensive stainless sink for now, figuring that no matter what I used would get destroyed once I started the basement renovation and lost my slop sink. I refaced the existing dishwasher with oak veneer. The original fridge is still working so I decided to put the dollars for a new one elsewhere. Most people opt for solid color granite. I think this is a mistake. 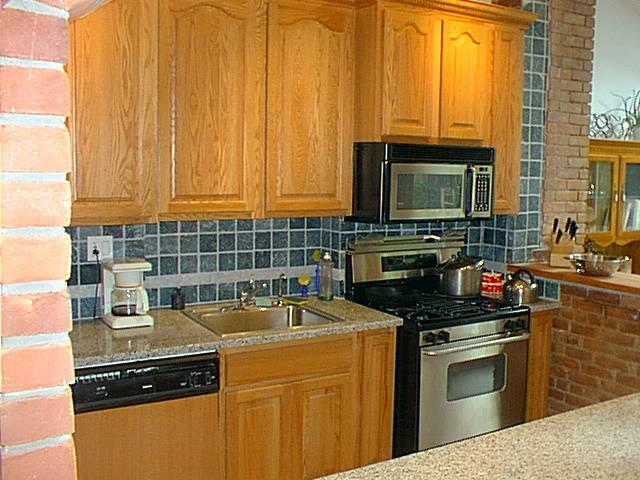 Not only does it wind up looking like an artificial countertop, granite has a tendency to scuff and scratch. Patterned granite will hide this and keep looking good for years. Black granite especially is a maintenance queen. The tile floor is down. With the tin ceiling, the natural oak cabinets and the granite counters, I decided to complete the retro ice cream parlor look with one-inch hex tiles. I really wanted a border strip too but was eventually talked out of it by a neighbor because it would draw attention to how narrow the kitchen is. Here's a tip I learned the hard way: when working with small tiles like this you're going to get a lot of thinset oozing in the joints. You'll make life a lot easier for yourself if you color the thinset to match the color of your grout. 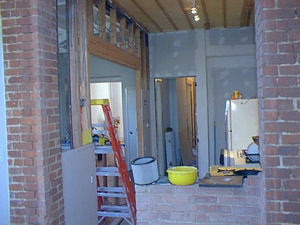 Moulding is added in the extension and the brick eyebrow is up. 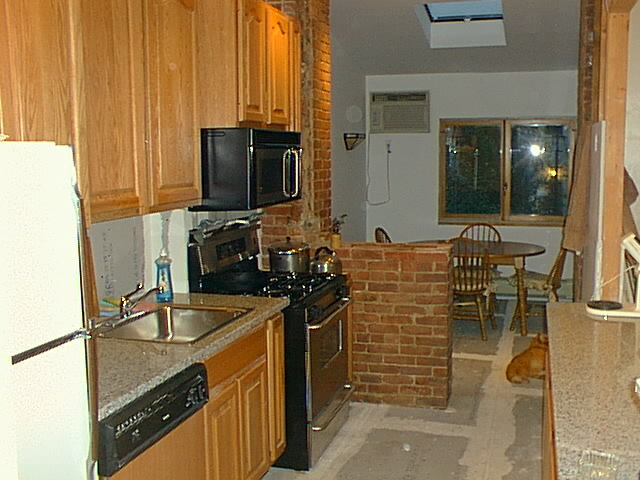 Then I waited two weeks for the mortar to cure before daring to remove the scaffold over that granite countertop. I wish I'd gone with divided light windows in the back, but it would have delayed closing in the extension for another week. Crown moulding is added to the cabinets, the walls are hung and skimcoated and the tile is on. Looking at the photos, I think I need to do something special with the addition. It's too plain. The tile backsplash is in. I used the same green and 1" white marble accent tiles that I used on the foyer floor, but with a grey grout to tie it in with the granite countertops. I also built some butcher block to cap that brick kneewall next to the stove. This is the real deal. I made it with 3/4" maple strips and 3/8" threaded rod, finished with mineral oil. No glue. Nice work. I have a question... Is the wall between the kitchen and dining room a load bearing wall? 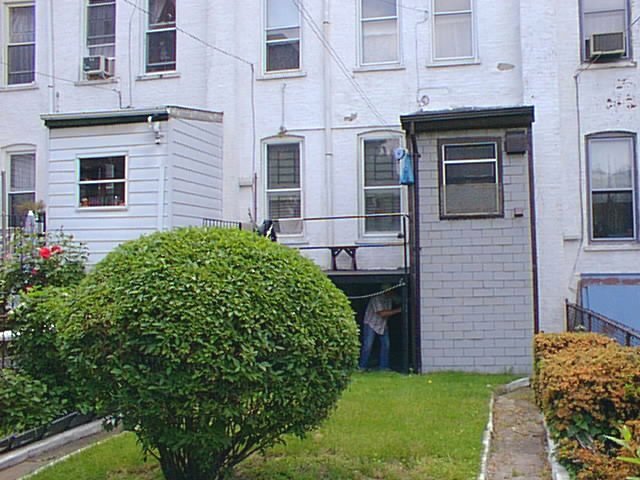 I have a similar row house and have noticed in the cellar a row of steel columns directly beneath that wall. I am wondering if that wall on every floor is load bearing. There was indeed an old wood beam under this wall but it was so chewed up by termites that it was functionally useless. I had an engineer take a look at it and he said that beam existed mainly to take some bounce out of the floors. 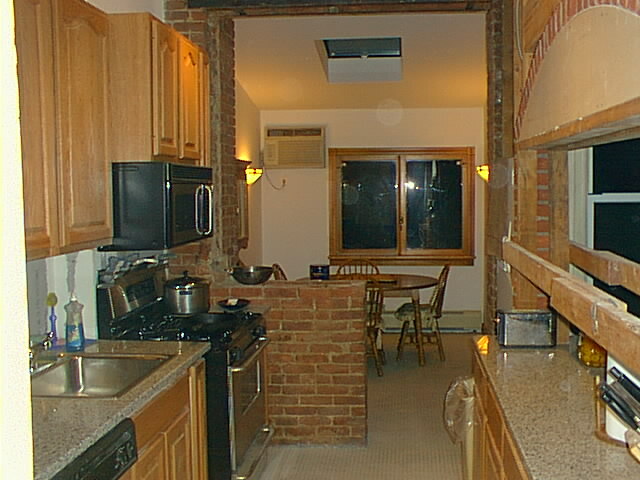 Before I started on the kitchen I replaced that basement beam with a steel I-beam. I didn't want any flex in this wall with a couple of hundred pounds of bricks over a thousand dollar granite countertop. 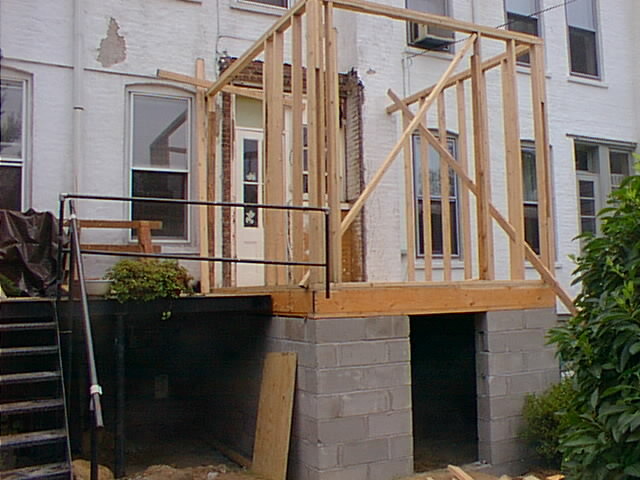 There's a 4x10 header over the brick to transfer the upstairs load to that I-beam. fabulous, thank you for posting this. p.s. i had to enlarge the second pic with chopper in it to find him lying on the floor with his eyes blazing. protective coloration! What product did you use to seal your floor. My husband and I just laid what looks like similar tile (1.25 inch unglazed hex tile)and used a penetratig sealer on the tile and a grout sealer but all that grout makes me a but nervous...What has your exprience been/ Thanks in advance for any advice. That's what I used too. That's what I used too. It's held up well. LOL - What do the purist's know anyways??? 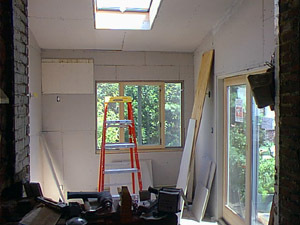 "The walls and ceiling were insulated and the sheetrock hung. Purists will be skeptical of all the small pieces of drywall I used over the window but I under-ordered for this stage. I only owned motorcycles and I didn't feel like paying a lumberyard $50 to deliver an eight-buck sheet of Type X. I'm pretty good with a taping knife though." I want to do a renovation project on my kitchen and am browsing around to do some research. I have hardwood on my floors and wondering whether or not to get it replaced with tile? I ran across this ad that says new kitchen in a box which only costs $25 and I am wondering if I should give it a try because of the price. This would save me hundreds. My fellow DIY-ERS advice plz? I bought something similar from another manufacturer for my own floors (big dogs and finished floors don't mix). I tried it out on a piece of finished scrap lumber and what it looked like to me was a sealer with the consistency of liquid floor wax. After it dried, I lightly ran a 3M scrubbing sponge over it and it looked like it all came off. To me, it seemed like a very temporary fix that would only make it more problematic to refinish the floor later. It's hardly a fair test but it convinced me not to use it on my floors. 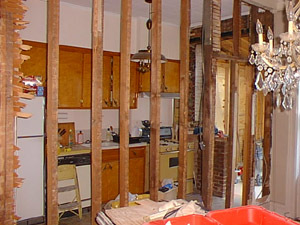 You should Google for a more expert opinion or ask the forum folks on OldHouseWeb.